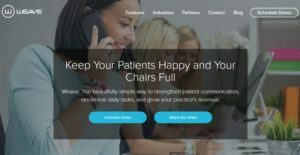 Weave is a dental practice management and communications solution that helps practices improve efficiency and build strong patient relationships. It provides users with meaningful and detailed information about patients, allowing practices to build rapport when communicating with patients. It streamlines daily task management and puts important information at the fingertips of users. It helps identify problem areas in the front office and makes it easier for practices to adjust accordingly. Practices get all the tools they need to build stronger patient relationships by meaningful interactions and effortless service. The platform provides instant access to important information needed for a great client experience and prompts users for anything that needs attention such as outstanding tasks. The easy-to-use, yet powerful features minimize the chances of missing an appointment and allow practices to stay on top of their workflows. Weave allows practices to automatically send personalized appointment reminders that help reduce no shows. Users can choose to send a reminder one or two days before the appointment as well as on the appointment day. The reminders are customizable and practices can choose to send them to confirmed, unconfirmed or all appointments. There is no limit on the number of unique reminders users can create and schedule. Automated confirmations make life easier for the staff by automatically updating the status of confirmed appointments. The platform provides users with easy access to important patient and scheduling information and allows them to access it from anywhere, using any device. This helps users stay productive while on the go and makes it easier for them to manage workflows even when they are out of office. Weave Reviews provide a solid and easy-to-use platform to manage and enhance online reputation and allow posting reviews on Facebook, Google and other industry-specific sites such as Healthgrades. The system automatically sends a notification when it finds a negative review, allowing users to offer help and follow-up in a timely manner. The reporting tools make it easier for users to view, filter and analyze information and provide actionable insights into operational productivity. Daily, weekly and monthly reports are customizable, which means users can quickly find the information they are looking for such as missed and answered calls. Smart Pop-up Notifications makes it easier for the front office staff to find opportunities, complete tasks and schedule appointments by grabbing relevant patient information when they call. Users can clearly see the important information such as overdue appointments and outstanding balance, which allows them to give live on-call reminders and keeps them fully prepared for all calls. If you are interested in Weave it might also be beneficial to examine other subcategories of Best Dental Practice Management Software listed in our database of SaaS software reviews. Since each organization has particular business requirements, it is sensible for them to refrain from seeking a one-size-fits-all perfect software system. Needless to say, it would be useless to try to find such an app even among market-leading software solutions. The clever thing to do would be to catalog the various vital aspects that require consideration such as main features, budget, skill levels of workers, company size etc. Then, you should do your groundwork thoroughly. Read some Weave reviews and check out each of the other apps in your shortlist in detail. Such exhaustive groundwork can make sure you discard ill-fitting applications and zero in on the system that presents all the elements you need for business success. How Much Does Weave Cost? Contact the vendor to know more of their enterprise pricing details and other product information. We realize that when you make a decision to buy Dental Practice Management Software it’s important not only to see how experts evaluate it in their reviews, but also to find out if the real people and companies that buy it are actually satisfied with the product. That’s why we’ve created our behavior-based Customer Satisfaction Algorithm™ that gathers customer reviews, comments and Weave reviews across a wide range of social media sites. The data is then presented in an easy to digest form showing how many people had positive and negative experience with Weave. With that information at hand you should be equipped to make an informed buying decision that you won’t regret. What are Weave pricing details? What integrations are available for Weave? If you need more information about Weave or you simply have a question let us know what you need and we’ll forward your request directly to the vendor.